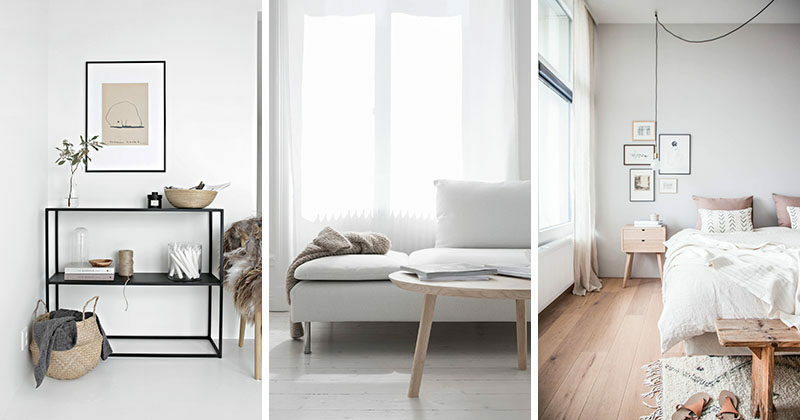 Call it by the name that others call it – Scandinavian, Norse Minimalism or Scandi – yet what you often picture are the light wooden floors, walls splashed in white and the abundance of sunlight. There are numerous students that have studied Nordic discipline and through them, the world is educated with this beautiful – yet often misunderstood – interior design. Using a monochromatic palette is rampant in any Nordic space. You get a wintry feeling as the lighting and style take center stage. The original Nordic landscape offers this same icy motif. You get a striking, all-white look where white dominating any other sporadic shade elsewhere. Neutral and grayish colors are acceptable while keeping minimalism in mind. You have the leeway to improvise or to add a little color if you really want to especially if you have a contemporary home. Having an all-white surroundings can get boring for modern settings so, in such cases, be sure to use more color. Think of the white background as a black canvas where you can unleash your creativity. With a little visual inspiration, you can splurge around some colors in an elegant way. Just think of a kitchen which sticks to the black and white concept – this can be expanded by allowing a little turquoise blue or brown hues to be used on the adjacent hall. The rest of your home can follow this same pattern while making sure that white still dominates the rest of the colors. Thanks to the seemingly blank feel of white, adding more vibrant colors can result in a more animated look. Use greens, blues, browns and reds if you want to uplift the mood in your home. Be sure that the décor comes in solid shapes and dark colors so that they stand out to become foreground. Nordic interior design is renowned for its utility, simplicity and beauty. Many Scandinavian homes have this bare style, nevertheless, they are still warm and have an understated elegance. The clean lines and flawlessness in furnishings are quite important since these also characterize the Nordic design. If you are a lover of ornaments, then you might find this style to be a little low key. If you want to have this theme in your home, then you have to be prepared to strip down the rooms and start shopping for items with earthy tones. Use wall-to-wall carpeting and light wood flooring. Do this for all of the rooms except the bathrooms. Use cool gray and blue textiles and, as always, have the walls painted with a white color. Scandinavian interiors are known for their colorful textiles so buy a lot of those. Use wooden materials and be ready to flaunt them. Use cladding on walls and ceilings. These can add warmth and texture. For yellow woods such as oak or pine, be sure to use gray oil. Do not use intricate designs on your furniture. Remember that Scandinavian architecture has clean lines. Use insulation for your walls and roof. Find any eco-friendly interior design aspects and add them to your Nordic home. Have an inside-outside room – this is that room that effectively fuses the outdoors to the home’s interiors. Make good use of your home’s deck or terrace. The balcony can even be used for barbecue parties. Make good use of your home’s fireplace – every Scandinavian home has it. Remember how harsh Scandinavian winters are? This is why the furnace is a staple in every Nordic styled home. Do you still think Nordic interior design is unfeeling?